In late October last year, WordPress.org announced the new embeds feature in 4.4. 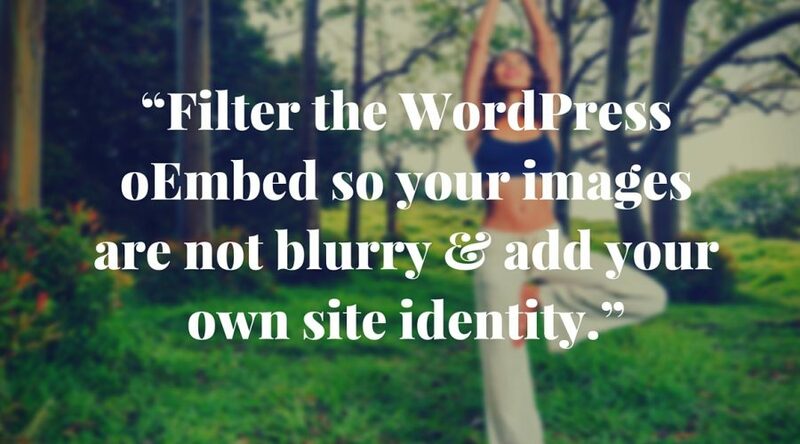 I noticed that some WordPress sites I embedded, including my own, had blurry featured images and the WordPress logo instead of their own. This post will instruct you how to correct this. First let’s get some history, you are not going to touch the WP core. If you look at the /wp-includes/embed-template.php file (4.4) or the /wp-includes/theme-compat/embed-content.php (4.5), you’ll notice that the script is working some php math to find the ratio for rectangular images. If your best fit for that rectangular image ratio is an image size (add_image_size) that is small, then the resulting embed will be blurry across the web. 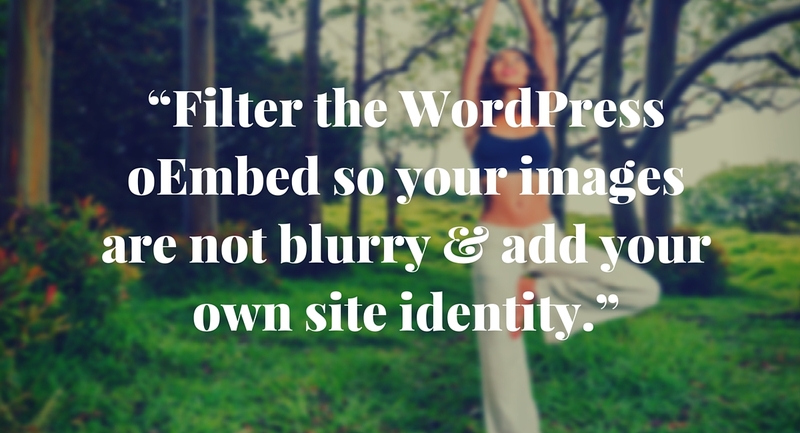 To check if your site’s embed is blurry (you must be updated to WordPress 4.4x), paste in a url to one of your blog posts in another post in draft mode. You can use the visual mode for this test. In a couple seconds, your post will show up like the one below. If you have a featured image on that post, that will show up as well. Then, rather than running all my images through regeneration, I name my images so that they are easy to find, and I just regenerated the thumbnails on those. I recommend that you do small batches at a time when you regenerate your thumbnails. To force this most reasonably sized image, I use the embed_thumbnail_image_size (found in the embed-template.php or embed-content.php mentioned earlier) filter in my functions.php file and I use the 'embed-image' in the variable content. That’s it! Cache clearing is a good idea. If I didn’t use WP Rocket, I would then visit the popular pages on my site (WP Rocket will preload cache, so it ROCKS). Be sure to ONLY use FTP and a code editor and make sure you are well outside other functions. Also, if your name is not Christina, change the prefix. You need to have a square image of your logo at 64X64 or higher (but not crazy high). I created a huge square site icon and then used Makeappicon.com and put them in my root since many devices see these without adding cruft to my head. For the .ico and smaller .png sizes, don’t use the generated version and make your own small versions since the quality can get crappy sizing down. Tip: Photoshop, open up your icon, save as a different name, then size it down in 10px increments and use the setting for reduction (can’t remember offhand). Thanks for this tutorial. And your site is full of other great tuts too. Thanks for sharing the knowledge! After almost 2 hours of searching all kinds of stuff i finally managed to find this page and THANK YOU VERY MUCH! WordPress should give us option to change this inside the panel.